Old fashioned smoked meats you will love!!!! Do you need your livestock butchered on your farm? 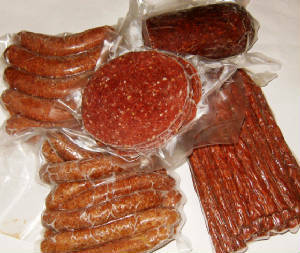 Count on the custom butchering services of Riverside Meats and Processing in Swanville, Minnesota. Contact us today for more information about our services. Our butchering truck will come out to your farm to perform butchering on-site. We butcher the animals on your farm, then take them back to our facility for further meat processing to your specifications. Our truck normally visits farms within a 60-mile radius, but feel free to contact us if you live further away. You can also bring your live animal to our location and we will butcher here for you including cattle, hogs, goats, and sheep. *hanging weight is the weight of the animal on the rail after being butchered. 50% DOWN PAYMENT REQUIRED AT TIME OF ORDER. Our beef are dry-aged for 10 to 14 days unless the customer specifies otherwise. Ask us about paper wrapping or vacuum sealing. There are many other options for your processing; your special requests for other items may be made when cutting orders are taken. GROUND BEEF- 1 LB. 1.5 LB. OR 2 LBS. If you buy a mixed quarter of beef with an average weight of 200lbs. You will get about 110lbs. of meat after processing. If you buy a half of hog with an average weight of 100lbs. You will get about 65lbs. of meat after processing. Riverside Meats processes animals mostly boneless, we leave the bone in the Porterhouse/T-Bone steaks, chuck roasts, and ribs. Cutting this way will save on freezer space and the cuts are easier to prepare. If you prefer the bone left in your meat you must request it when your cutting order is received. Riverside would like the meat picked up within seven days of notifying you it is ready.